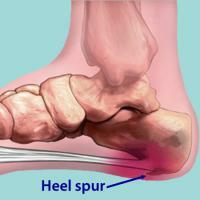 One frequent cause of injury to the plantar fascia is pronation. Pronation is defined as the inward and downward action of the foot that occurs while walking, so that the foot’s arch flattens toward the ground (fallen arch). A condition known as excessive pronation creates a mechanical problem in the foot, and the portion of the plantar fascia attached to the heel bone can stretch and pull away from the bone. This damage can occur especially while walking and during athletic activities.